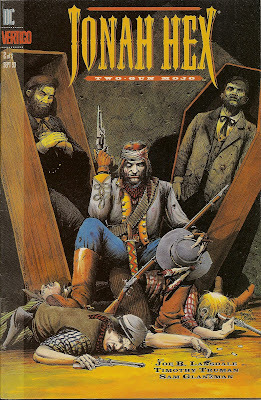 Matching Dragoons: Jonah Hex: Two-Gun Mojo #2 "Invitation to a Hanging"
Jonah Hex: Two-Gun Mojo #2 "Invitation to a Hanging"
Slow Go Smith is sitting up in the stable, the gun-toting corpse slowly advancing, having already shot Smith once. Then a weird robed figure peeks from behind the corpse and says "Pee Pie!" in a sing-song voice. Jonah Hex is running down the darkened street when Smith realizes he is out of bullets and throws his pistol and nails the robed figure in the head. Bloodied, the figure turns back to the darkness of the stable and shouts "Take him, Bill" and another corpse stumbles out of the shadows. Smith pulls a knife, determined to fight to the death. He throws the knife and Bill draws his pistols and catches the knife in mid-air between them. Suddenly Bill unloads both pistols into Smith. Hex kicks in the door to the stable, sees a shadow with a pistol and plants several shots right into one of the bodies that was being used for photographs earlier in the day. Bill turns and shoots Hex, grazing his skull. The robed figure shouts for Half-Pint and Stretch and the rest to load up the stuffed boys but leave Smith and Hex because they're too fresh. A skinny giant, about 9 feet tall, a midget with a pumpkin for a head and a fat woman eating a turkey leg come into the barn, load up the bodies and then we see the Wagon of Miracles take off into the night (making the robed figure, Doc "Cross" Williams). Hex comes to and walks over to the dying Smith. They have an exchange where Smith asks Hex to kill the bastards that killed him. Hex says that he has a personal vendetta against them because he accidentally shot a corpse. 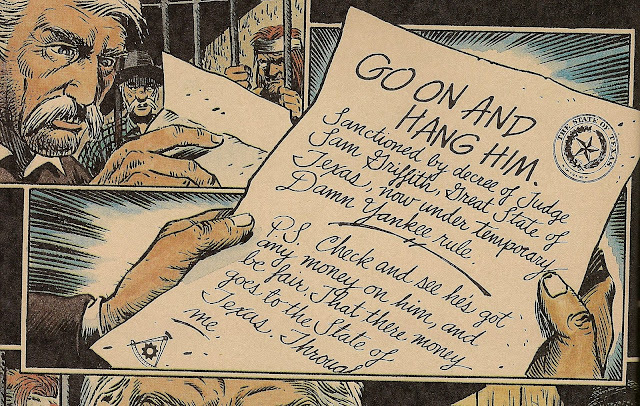 Smith dies and Hex notes that he hates a fella that takes his time dying. Of course, just then the Sheriff and the whole town show up, armed to the teeth. Hex tells them about the bodies being stole by the weird bunch but the Sheriff tells Hex to drop his guns and they'll talk about weird crap later. Hex decides he can't outgun the whole town and drops his gun and gets carted off to jail. The town starts work on the hanging scaffold first thing in the morning with Jonah Hex sitting, biding his time in the cell. The Sheriff shows up with the undertaker to take measurements for the coffin. Outside the town is in full swing, selling all kinds of food and toys, getting ready to take photos of the hanging. Through all of the commotion, the Indian barmaid walks silently towards the jail. She enters the jail and when the Sheriff demands to know her business, she quietly disrobes and stands before him naked. The Sheriff, not one to pass up any opportunity, strips off his pants and looks up in time to see the woman holding a pistol to his head right before she pulls the trigger. The gunfire is hidden by all of the firecrackers going off in the street. She grabs the keys and lets Jonah out of the cell. Hex thanks her and says that she would be better off coming with him. They start to sneak out of the jail but they are spotted by the town. They mount up on a horse and the town suddenly springs to life with people intent on shooting Hex before he escapes. Hex shoots two people quick as a wink and then the fella selling postcards steps up only to meet a bullet himself. Hex then draws a bead on the photographer and shoots him as well. As Hex rides through town, the thug from the bar attempts to shoot him but nails a bystander in the head. The bartender steps out of the saloon and shoots the Indian girl as they ride past. Hex reigns in his horse, grabs the reigns in his teeth and charges the barkeep. 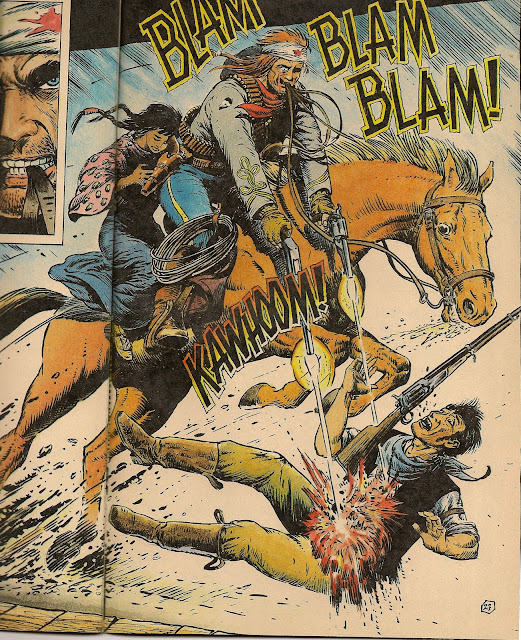 Jonah unloads two pistols into the barkeep as the frothing horse jumps over the blood spewing body. Hex then rides off into the distance. The townsfolk are furious over all the dead people, the loss of their Sheriff, and the sudden cancellation of the hanging and picnic. They mount up, form a posse and head out after Hex. Men Killed by Jonah - 5 that we can see. Timeline - Same evening from last issue and the next day. Overall I would say we are in day three. This one had a hellofa lot of action in it and just spun deep into the weirdness at the beginning. One thing that I didn't care for, and it will be an ongoing gripe, is the overall ugliness of the townsfolk. I don't know if it was supposed to be a comedic tone being set or what. Remember the village idiot that Hex makes Sheriff in the Jonah Hex movie? He would be a Burt Lancaster in this town. And everyone appears to be either corrupt, an idiot, or both. The series is starting to turn sour for me by the end of this issue. Next Issue: The final fates of the Indian girl, Slow Go Smith, and Jonah Hex confronts Doc Williams. I think you've hit on the reason I really dislike the Vertigo minis: they're just so relentlessly ugly. A Hex story needs a little ugliness to be firing on all cylinders, but when everybody's a freak and the humor is primarily gross, the overall effect is just draining.